Though I now see so much more clearly the possibilities with Lady Jane, the reality is I've got a long way to go. Right now I've still got plenty of rust to get a grip on. There is no other way than to get my head down, and get on with it. 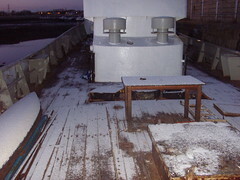 The picture shows a recently primed section of my foredeck. Things are warming up after winter, and now the clocks have changed it's light much later in the evenings. This makes working late so much easier. I find myself brimming with thoughts and ideas for Lady Jane after all that I've seen on Wanderbird. I thought I would post a few pictures to give you an idea of what has helped inspired me. 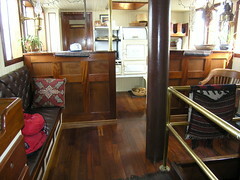 This picture shows the homely living space that is the galley, towards the stern of Wanderbird. This is what I would like to achieve on Lady Jane - creating spaces I really want to be in, rather than simply building something functional. It's hard to describe the attention to detail Rick and Karen have applied throughout Wanderbird. The pictures give some idea, but the finish really has to be seen to be believed. 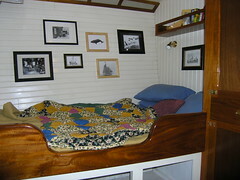 This picture shows a typical double cabin in Wanderbird, one of six passenger cabins in total. Note the wonderful woodwork, setting an impressive standard to strive for. Pictures of Wanderbird's interior would not be out of place in Homes and Gardens, or the like. The full set of my Wanderbird pictures can be seen here in Flickr. 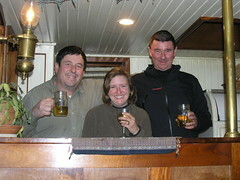 I'm back from what has been a tremendous trip to see Captains Rick and Karen Miles, and their boat Wanderbird. That we have so much in common immediately became apparent, helping to build what will hopefully be a lasting friendship. Wanderbird is both a home and a business for Rick and Karen. It is obvious just how much work and love has gone into every aspect of their boat, with the finishing touches throughout in a league of their own. A high bar for anyone wanting to convert a working boat to a live aboard. I particularly enjoyed sitting chatting about our shared experiences over some wonderful meals. It's some comfort to discover Rick and Karen have been through so many of the same things I've been experiencing with Lady Jane. It's safe to say that the job will never be completely done, though while I'm still working on the conversion of Lady Jane from a fishing trawler to a liveaboard, Rick and Karen are working on perfecting what they have so far achieved. There is no doubt about it, the trek all the way from the UK to Larry's river, Nova Scotia, Canada was well worth it. The thing that impressed me overall was the realisation that it really is entirely possible for me to make Lady Jane a comfortable and warm home. There are plans for me to go across and cruise with Rick and Karen on one of Wanderbird's summer voyages, and for Rick and Karen to visit me here in the UK some time after that. There are also tentative plans for us to do a tandem voyage sometime in the not too distant future, which should prove to be good fun for all concerned. My heartfelt thanks to both Rick and Karen for their wonderful hospitality. I wish them smooth seas and look forward to us doing more fun stuff together. I'm disappearing off into the sunset, and abandoning poor old Lady Jane. For a while anyway. I've made entries about captains Rick and Karen and their boat Wanderbird before. Finally, after all this time, I'm now off to Canada to meet them, and Pilot and Maggie of course. The timing of this 'holiday' is exquisite, and I know I'll get back brimming with ideas and enthusiasm for what could be achieved with Lady Jane. Hopefully, as a result of the knowledge I'll glean, I'll also be able to avoid making what could be some expensive mistakes. This trip may seem like an extravagance, but it should more than pay off in the long run. Needless to say, blogging may be a bit patchy, if at all, while I'm gone. Finally, the weather has improved, in fact it has been lovely and sunny. Perfect weather for working outside. I arrived at the boat, only to find Mildred, one of the muddy swans, guarding her nest. 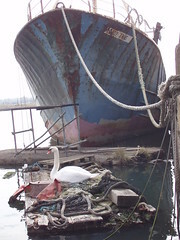 So as not to disturb the swans as the nesting season begins, I'll have to forgo getting that last little bit on the bow done, and work on the stern instead. Mildred moved off once I'd been working on Lady Jane for a while, presumably in search of food, so I'm hopeful that, before nesting starts in earnest, I'll get some primer onto the section you can see I've already prepared. If need be, I can always turn the boat around to work on the bow while the swans are nesting. Brutal cold winds has ment that not too much has achieved on Lady Jane recently. Brutal cold winds and snow did not stop me going to Fourmarks, to watch the first day of the motor racing season. The idea of staying in a nice warm, cozy bed to watch the opening round of F1 did cross my mind though. 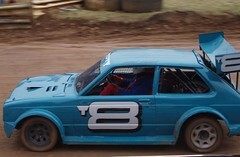 Here Mick whizzes by in his newly built Toyota/Vauxhall race car. We are expecting good things of him this season. A really fun day out, and a chance to catch up with plenty of folk I've not seen in quite a while. 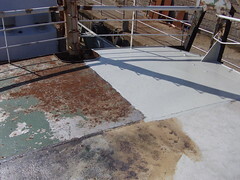 Ok, I know it looks grim, but the galley deck head has now been sealed with two coats of bitumen paint. 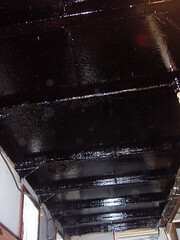 So far, it seems like bitumen paint is a good, inexpensive, option for stopping rust. Next will be to put up 2 by 2 wood lengths, using a Hilti gun, then pack in some insulation. Once the insulation is in, I'll cover the whole lot with plywood, screwed into the 2X2 lengths, and then probably simply paint over the whole lot. I know this is a bit of a bodge, but this will all need to come back out at some point, when I get around to re-furbishing the galley properly. For now though, I'll be pleased to have the galley clean and bright for a change. There is a long way to go with the shower room project. The picture shows me cleaning up the edges Robin has just cut with the Oxy-Acetalene torch. From here on in, the lion's share of this phase of the work is Robin's, as the welding here needs to be well done. 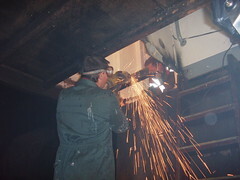 Last I saw, the first section of deck plate had been welded in place. With the welding complete, it will be down to me to finish off the fittings, plumbing and painting. I will be so pleased to get this section of Lady Jane all welded up again, as this has caused a big mess in the engine room, the galley, the battery room and the aft accommodation. Having the shower room fully functional also brings me one step closer to being able to live on board. My heating chamber is finished, except for a small section I'll need to cut out for the heater mains cable and the piping from the foam cylinders to fit through. 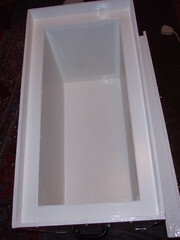 I plan to cut a small insert from the lid, so I can glue it all back in place afterwards, for when I use it as a cooler. Initial testing has shown I'll need to 'fix' the thermostat in the fan heater, as it does not seem to want to heat up as much as I'd expect. I suspect there is a separate thermostat on the fan motor which will need some adjustment, as the heater itself can put out well in excess of the required 27 degrees. I'm quite pleased with how my 'box in a box' has turned out, it is a very cool box. It was with some relief that I finally dropped the new hatch cover in place. You can see the old, very rusty, hatch cover standing behind the new one. The holes in the old one make it obvious why it was easier to simply start afresh. I had some flat roofing materiel over the old cover, to stop water getting in, but I'm much happier knowing the hatchway over what used to be the fish hold is properly watertight and, more importantly, safe to stand on. I still need to weld some fittings on, so the hatch can be dogged shut and a handle so it can be opened again. Once all the welding is done, the cover will need priming and painting and a rubber seal glued in place. So there is still quite a bit of effort left on this particular project. As it turns out, the hatch bowing slightly outwards works to my favour, as I'll not have water settling on top of the cover. You could not make this kind of thing up if you tried! In this modern day and age, with all the electronic gizmos and gadgets you can get on a ship, one does not expect something this size to run aground. 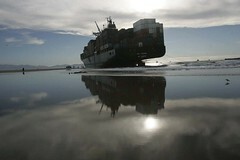 What has essentially happened is this ship ran aground on a beach very close to a Mexican port, Ensenada. The thing is, she ran aground on Christmas day and, despite the efforts of some seriously big tugs and obviously a number of 'experts', she is still aground today. Months later. The full story is well worth a read. It has now extended to three pages, with some very amusing commentary. I especially like the "Salvage Cost Calculator" down towards the bottom of the page. 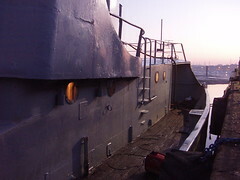 While it seems unlikely, this is part the aft accommodation project. At some point quite soon, I hope to start applying the spray foam insulation I've bought. To use the spray foam, the cylinders they come in must be heated to 27 degrees centigrade (that's eighty ish in American degrees). Heating something to 27 degrees on board is a bit of a problem, as I've not really got anywhere on the boat insulated enough to properly heat the cylinders and anyway, because I produce all my own power, I don't want to run a generator more than I need to. To solve my heating problems, I've decided to make a heating chamber. This is basically a big, insulated, box. 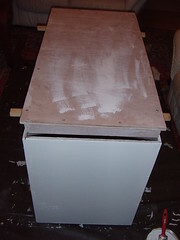 You can see I've made a start on it in the picture. After about 10 seconds of thought, I realised I could also use this as a beer cooler when I have barbecues (braais for some folk) on board in the summer. Because of this, I'm putting more time and effort into the coolbox heating chamber than would otherwise be necessary. After all, I've got to get my priorities right. There it is, my watertight hatch cover. It's only a sense of decorum which stops me from putting the word 'watertight' in bright, flashing, neon colours, I'm that proud of getting the edges welded watertight first time. 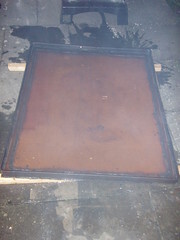 The picture shows the cover topped up with water, by way of a test. The splashes either side are not because of any leakage, merely the result of me trying to level the thing while it was partly full of water. I've still got to survive a critique of my welding from Robin, but even he is bound to be a bit impressed. 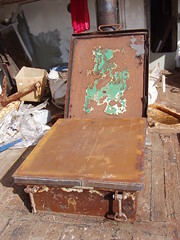 There is still more work to be done before the cover can finally be commissioned, and the old one dumped, including welding fittings and handles on and, of course, painting it. I don't feel up to welding a new section of plate into the hull, or anything quite of that magnitude just yet, but this has been a big confidence boost for me. 6.30 in the morning, with more snow forecast. Generally I'm motivated to get going with work on Lady Jane, but right now I've suddenly found more important things to do. Things that don't involve cold steel or standing about in the snow. I'm particularly envious of Fred, who is apparently suffering from the heat in the Australian Outback somewhere.